My first ever For-Him design. Measurement: 1.5" tall and 1 1/4" at its widest measure. Clean and Sturdy design, suitable for daily wear. Dedicated to a work-partner from WorldVision. Inspired by World Vision (http://worldvision.org) spirit, knotting experience adopted when I was making my first handbound book! This tutorial is composed using 99(including coverpage) high-resolution pictures, all steps and procedures are zoomed and focus to deliver the precise instruction via a set of terrifically clear pictures. List of tools and materials used to achieve this composition is included in this document. 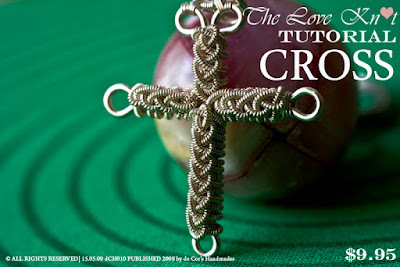 You can also pay for the tutorial via PayPal by sending 9.95USD to decors.l@gmail.com by specifying "DCH010 CROSS" in the title of the transaction, or click on the Add to Cart button to purchase. The PDF file will be sent to the e-mail address set in your PayPal profile.